The oil Flow Laboratory was commissioned in 1995. 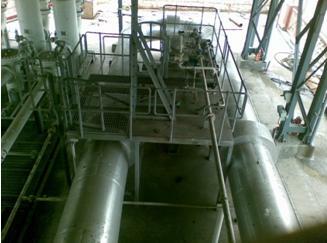 The principal flow medium is EXXSOL D 80 and the maximum flow rate attainable is 650 m3/hr. The flow medium used is equivalent to aviation turbine fuel. 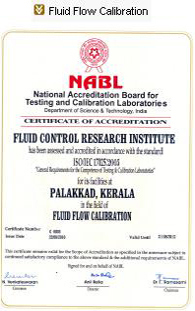 NABL (National Accreditation Board for Testing and Calibration laboratories) has accredited OFL for both testing and calibration categories. Also Legal Metrology, Weights & Measures unit, Department of Consumer affairs has recognized the laboratory for conducting Model Approval Tests on flow measuring and volume measuring instruments. The measurement uncertainty is 0.025 % in mass, 0.04 % in volume and 0.075 % in volume flow rate. The test section can handle pipes of a maximum nominal size of 250 mm (10”) NB and the minimum it can handle is as small as 6 mm NB. The medium of flow is EXXSOL D80 , with a kinematic viscosity of 2.06 Centistokes at 25 deg C and a specific gravity of 0.78. The fluid Exxsol D 80 is dearomatised hydrocarbon which is very similar to ATF. The flow determination system consists of three weighing platforms of capacity 10000kg, 2000kg and 300 kg. 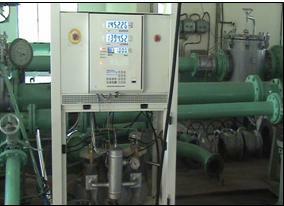 The system is also capable of determining time of collection of fluid using the signal from ON-OFF valves. The density is determined from an online densitometer. FCRI has a multi viscous flow facility having max pressure of 10 bar with 300lpm maximum flow with Exxsol D 80, Hydrol 32, Hydrol 68, Hydrol 110, Hydrol 220, Hydrol 460etc as medium with measurement uncertainty in mass 0.025 %, in volume 0.04 % and volume flow rate 0.075%. Apart from the above specified viscosities, customer can perform calibration in any specific fluid of their choice, if they can supply about 500 litres of the fluid. The flow meters to be calibrated will be assembled in the test line , the test line will be flooded by oil and entrapped air cleared through air bleeds. In gravimetric system of calibration, the net mass of oil collected will be noted & air buoyancy correction done , then volume calculated by taking density at that temperature and compared with the indicated reading / output of the meter. Flow meters used for custody transfer are calibrated in Oil laboratory. 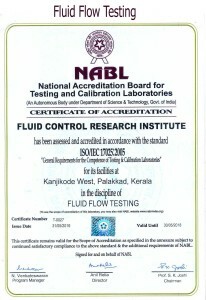 The calibration method includes the checking of the flow meters at various flow rates , correcting the indication of the flow meter if necessary and then repeating the calibration for various flow rates , specifically including the flow rates as per the customer requirement The maximum flow meter size that can be calibrated / tested is 10 “ NB and the minimum size is ¼ “Nb. Customers can send their representatives for witnessing the calibration / Testing if they wish. The pattern approval / model approval is a mandatory requirement for measuring instruments for which commercial or quality implication is coming in picture. The approval for the instrument has to be obtained from the Director , Legal Metrology. 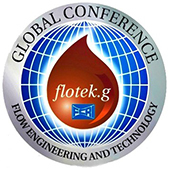 The Director, Legal Metrology has approved FCRI for conducting such pattern approval test on flow meters. The meters which are referred from the office of the Director , legal Metrology will undergo pattern approval test as per OIML R 105- “ Direct mass flow measuring systems”/ OIML R 117 “Measuring systems for liquids other than Water” at FCRI. The test report will be forwarded to the Director , Legal Metrology for further action. FCRI has been conducting model approval testing on many flow meters Viz, Mass flow meters, Positive Displacement meters etc. 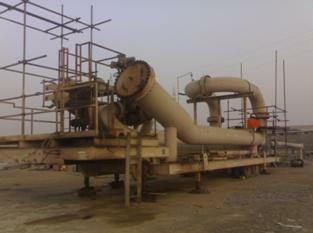 The entire procedure consists of 15 tests on the flow meter / indicator and would take nearly 3 months for completion. As part of evaluation testing of custody transfer metering devices at the oil flow laboratory, FCRI has designed , fabricated and validated a custom Test- Rig. For the performance evaluation of level sensors/probes up to 3 meter range . 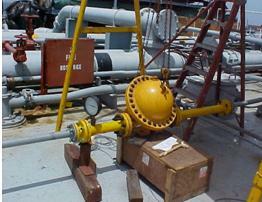 The probes are used for level measurement in storage tank in retail outlet. The work was done for M/s Veeder Root, USA. Aim of the experiment was to determine the accuracy of the probe for the level , and temperature measurement at controlled conditions. 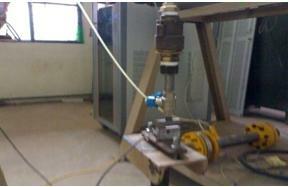 The probe was installed in the transparent test pipe and positioned at the required height. Bottom most part was taken as the datum . A measuring scale attached with vernier ( resolution – 0.1mm) was positioned along with pipe for level measurement. An RTD was assembled at the bottom of the pipe very close to the temperature sensor of the probe to minimize the error due to any temperature gradient. The probe was installed in a transparent pipe of 100 mm diameter positioned vertically. The bottom most part of the probe was taken as datum. Measuring scale attached with a vernier scale (Resolution – 0.1mm ) was positioned along the pipe for level measurement. The pipe was filled with diesel in steps of 10 % of the maximum range. Each level was measured while filling and emptying. The temperature was measured at fully filled condition only. The same procedure was repeated in gasoline also. The level of oil – water interface was also measured at different levels for all 5 probes keeping petrol/ diesel in measuring pipe, Water was added up to 200 mm in different steps. The water interface was measured at different levels while filling and emptying. Pattern Approval test of Auto LPG Dispenser from M/s. MIDCO was completed as recommended in OIML R117. The Auto LPG dispenser of M/s Midco Ltd., Pune was also tested with exxsol D80 as medium as per Standard EN 14678-1-2006 (E)-LPG Equipment and Accessories-Construction and Performance of LPG Equipment for Automotive filling Stations-Part-1 Dispensers. Variation in the internal hose volume test was conduced on the LPG hose as per BS EN 26801-1993/ISO 6801-1993, Rubber and plastics hoses -Determination of volumetric expansion. Visited the ship FSO ENDEAVOR for the physical verification and inspection of pipe prover and metering skid. Detailed report on the findings was given to the client. A 20” Uni-directional pipe prover in the ship FSO ENDEAVOR was proved as recommended in API. The job was carried out through M/s Nortans Maritime Services, Mumbai.The metering skid comprises of 20” pipe prover with three 250 mm turbine flow meters assembled in parallel. 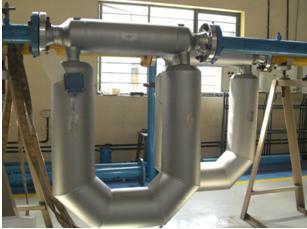 The Pipe prover was calibrated using master meter method as recommended in API. The proving was carried out at two flow rates. Five continual measurements were taken at each flow rate to calculate the repeatability. The repeatability of the measurements was within 0.02% and the prover was acceptable as per API recommendations. After establishing the base volume of the pipe prover, the turbine flow meters in the three metering skids were proved against the pipe prover. Witnessed and approved a 900mm Bidirectional pipe prover, which was calibrated by water draw system at two major refineries. The job was carried out for a multinational company. Repeatability of the provers were established at two different flow rates. Five repeated measurements were taken at each flow rate to calculate the repeatability. The repeatability of both the provers were within 0.02% and the provers were acceptable as per API recommendations. After establishing the base volume of provers, the crude metering skids at sites were also validated. 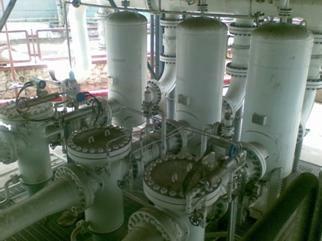 The metering skid comprise of three numbers of five path ultrasonic flow meters. The linearity and repeatability of ultrasonic flow meters were established against the pipe prover and the results were validated as per API. A reservoir ship at offshore was visited to audit the flow metering system and to analyze issues involved in the meter proving, batch report and the export quantity assessment .Individual issues were addressed in isolation and then as an integrated product to troubleshoot and correct the system. After in depth discussions with the operating staff suitable recommendations were made to correct the situation. Function of bulk marketing storage facilities known as distribution terminals, is to facilitate distribution of liquid products from storage to trucks (also railcars, barges, pipeline). Safety, Security, measurement accuracy, regulatory and reporting requirements are the key driving force in automation of loading terminals. Over the years due to regulations and cleaner fuel acts it has become essential to blend products, as an example, mid-grade fuel. Fuel additization became essential where a small percentage of additive had to be added to fuel. For terminal efficiency and cost it became essential to come up with techniques to blend products at the loading rack instead of having to store in tanks. Also it would make more sense to inject additive into the product stream as opposed to physically add additive into compartment at end of load. An integrated blending and additizing control system in terminals became essential not only for realizing efficiency, but also have a system that is configurable and can adapt to blending ratio changes additive percentages adjustments and accurate mixing to obtain on specs. Final product for distribution. 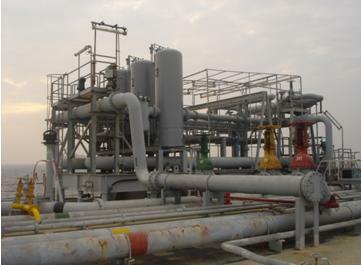 Integration of modules such as tank levels and inventory, terminal and loading gantry secured access, safety circuit monitoring and transaction management became essential to centralize the overall terminal operation. Blending products such as gasoline, diesel and fuel oils with variable percentages have become a common place for formulating gasoline to cater to different commercial and industrial needs. In the recent years due to increase in crude oil prices and dependency on foreign oil, ethanol blending is becoming common. Ethanol is produced off corn and soybean and reduces overall gasoline contents. A 10% mix of ethanol in products is becoming a common at the petrol pumps. Electronic Preset is capable of handling most of these functions and total control of the gantry loading. Prior to the testing of batch controller the mass flow meter was calibrated at different flow rates and the respective meter factors obtained were programmed into the batch controller. 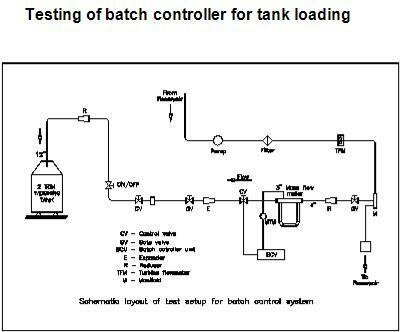 At each different flow rate different batch quantity was programmed in batch controller and the percentage error was calculated. 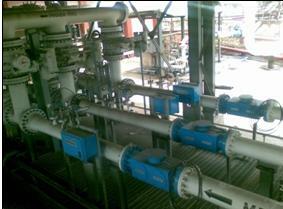 The batch control valve receives the signal from the batch controller to “OPEN “or “CLOSE” for the preset batches. The actual quantity of liquid passed through the system was determined using static gravimetric method. Witnessed and certified the calibration of seven Bi Directional pipe provers at Reliance Industries Jamnagar. 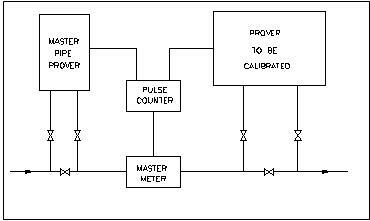 The provers were calibrated by master meter method. Meter factor of the master meter was established against master prover at operating conditions. After this the test prover was proved against master meter. The master meter was reproved against master prover. Average meter factor of the master meter was used to determine the base volume of provers under test. 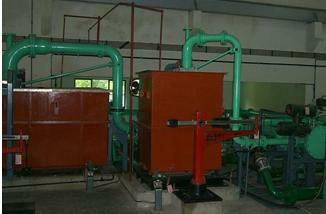 Repeatability of the provers was established at two different flow rates. Five repeated measurements were taken at each flow rate to calculate the repeatability. The repeatability of provers was within 0.02% and the provers were acceptable as per API recommendations. Seven provers include five numbers are mobile provers and two fixed provers. The En Numbers were estimated for the mean k-factors at each flow rate and it was observed that the En numbers estimated were less than one in all cases. The En number estimation was done with the assumption that TUV NEL National Oil flow measurement facility, UK is the reference standard as it had the minimum systematic uncertainty. 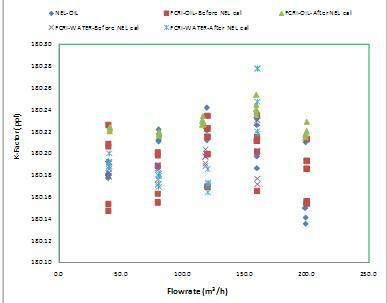 The K-factor of 3” NB Coriolis mass flow meter was determined at different flow rates in the range 40 m3/h to 200 m3/h. The measurement was done in oil and water at FCRI and the same was repeated at NEL UK for the same flow rates. When the results of FCRI is compared with that of NEL, it is observed that they are very close to each other and falls within the uncertainty limit reported by NEL. 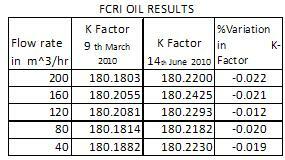 The deviation in k-factor, obtained at FCRI when calibrated in Oil flow laboratory, from that of NEL is 0.002 % to 0.03 %. Similarly a deviation of 0.0 to 0.03 % is observed in the k-factor obtained by calibration in water. The En number (expressed as the “E sub N” number) performance statistic is derived by dividing the difference between a participant’s test data and the test artifact’s assigned value by the square root of the sum of the squares (RSS) of the participant laboratory’s test data uncertainty and the reference laboratory’s test artifact’s assigned value uncertainty. This excersice has allowed the comparison of calibration result of a 3 inch NB coriolis mass flow meter calibrated at NEL, UK and FCRI, India. At FCRI the meter was calibrated in both oil and water medium before and after calibration at NEL UK. The comparison shows agreement between the calibration done at NEL and at FCRI. A maximum deviation of less than ± 0.03 % between NEL and FCRI result is only observed in the entire range of the meter. Throughout the range the result of FCRI lies within the uncertainty limit of NEL UK. As per the requirement of National Accreditation Board for Testing and Calibration Laboratories (NABL), India the calculated En value of the comparison should be less than one and this work is in agreement with the requirement of NABL. The tests were conducted in a span of about eleven months. It is observed that the variation in k-factor for the FCRI oil and water flow laboratory systems in this time period is very low (the highest being 0.03 %) compared to the claimed uncertainties( +/- 0.05 % by volume) of the laboratories. Hence it has been proved that the FCRI oil and water flow laboratories are well comparable with International systems and the system reproducibility over a period of time is good.